In essence, when you agree to cover for a colleague, you are totally and undeniably responsible to accept and respond to calls from patients as if they are your own. Where an agreement to cover for a colleague exists, the doctor/ patient relationship is established as soon as you receive the incoming call. From the time of the call your professional relationship and duty of care towards the patient commences. Without a working knowledge of the patient’s past history and medication, you will be unwise to triage him based on the information provided by the patient by telephone. It will be hazardous to decide that a case does not have to be seen with any immediacy and that it can wait for the next day, in the absence of a personal clinical assessment. In other words, when you are on call, you are required to see, assess and diagnose the patient in accordance with the standard of care which will be required from a reasonable medical practitioner in your position. Being on call means that you have taken full responsibility for the incoming caller’s health and well- being during the period of your cover and you can only do this by personally seeing and assessing the patient when the patient calls in. 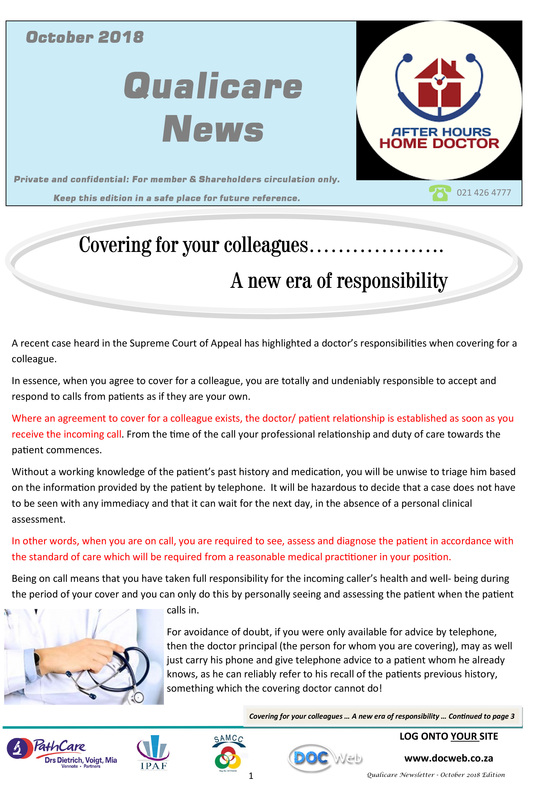 For avoidance of doubt, if you were only available for advice by telephone, then the doctor principal (the person for whom you are covering), may as well just carry his phone and give telephone advice to a patient whom he already knows, as he can reliably refer to his recall of the patients previous history, something which the covering doctor cannot do! The learning experience came from a recent Life Healthcare Case, involving a Durban Obstetrician who had undertaken to cover for an Obstetrician colleague who was unable to attend to the delivery of his patient. The covering doctor (who I will call Dr X) was informed by telephone at 10h30 on the day in question by the nursing sister on duty that the patient, in early labour, had been admitted for the doctor principal for whom Dr X was covering. Dr X issued certain instructions to the nursing sister including monitoring, as well as medication. The nursing staff set up a CTG monitor. At 18h35, some eight hours after the first telephone call, Dr X was again called and told that the CTG showed signs of decelerations with rapid recovery after the contractions. He then ordered the patient’s transfer to the labour ward and requested that her membranes be ruptured, and an epidural anaesthetic administered. He elected not to see or assess the patient personally at that time. It appears from reports that the nursing staff missed further clear CTG signs of foetal distress and only called him again at 19h30. A further deceleration thereafter was not reported to the Dr X, who only saw the patient for the first time at 21h20. At that time the CTG tracing revealed clear signs of foetal distress which had been present for some time. An assisted delivery was delayed as a result of the unavailability of equipment. The baby was delivered some 40 minutes later, having suffered brain hypoxia. Resuscitation followed but it was later found that the baby had developed cerebral palsy. The Supreme Court of Appeal (SCA) found that it was more probable than not that the birth injuries to the baby could have been avoided had the doctor attended the hospital urgently after the phone call from the nursing sister at 18h35. In his defence, the Obstetrician contended that his duty of care only commenced when he personally saw the patient at 21h20. The court however ruled that Dr X’s legal duty arose when he agreed to cover for his colleague and when he was advised of the patient’s admission to the hospital. The court found that a reasonable obstetrician would have visited and assessed the patient within a few hours of being advised of her admission. The court commented that Dr X’s failure to do so constituted gross negligence. The Hospital conceded that its staff had been negligent in the management of the delivery but sought a contribution to the damages suffered by the infant as it contended that the doctor had also been negligent. The court agreed, making an award of R 20 million to the family of the damaged child and apportioning the liability on a 60:40 basis (doctor : Hospital). So, there you have it. The legal requirements relating to covering have been restated by the Supreme Court of Appeal. In the light of this judgment you will need to consider, when offering telephone advice to an otherwise unknown patient, whether you are able to do so safely, in the absence of a formal consultation, assessment and diagnosis. Interestingly, the HPCSA rules on Telemedicine frown upon the first consultation being performed by telephone. According to these rules the first telephone consultation must be restricted to one where a previous doctor/ patient relationship exists and where the doctor is able to gather sufficient knowledge of the clinical condition which is the subject of the request, to render clinically justifiable his diagnosis, treatment or recommendation. You cannot do this whilst covering for a colleague, or even worse, a number of colleagues and fielding calls from their patients who have never before seen you and about whom you have no prior knowledge.